« No Piggies In These Blankets! I first caught wind of this culinary concoction at Culinary in the Desert. I was in complete and utter awe of the thing and immediately resolved that it would be mine. I then went to the source, veganized it, and happily paraded it into a room of unsuspecting people – all of whom reacted with wide eyes and mouths shaped into “O”s of wonder. When I declared it was time to slice and serve the giant cookie cake, I turned my back on the room in order to cut the cake, and when I turned back I was faced with a line of eager people, forks and plates in hand. Given the enormity of this cake – five layers of chocolate cookies with four layers of frosting – I was shocked that there was no cake left at the end of the party. The original recipe called for heavy cream, which caused a moment of head scratching. What in the world would a vegan use instead of heavy cream? I usually just avoid recipes that call for it as an ingredient. I decided upon coconut milk, which did the just the trick. Be sure to only use regular coconut milk and not the lite version – what you’re after isthe fat (and c’mon: you’re making a giant cookie cake – it’s a little late to start worrying about calories!). Just plan in advance – the coconut milk needs to be refrigerated for at least four hours before being used in this recipe. 1. Preheat oven to 350 degrees. Whisk flour, baking soda, and salt in a medium bowl. 2. Put Earth Balance and sugars into mixer bowl; mix on medium until pale and fluffy. Mix in vanilla, soy yogurt, and oil. 3. Remove chilled coconut milk from the refrigerator and spoon out the thickened cream at the top of the can. Reserve the coconut water for another use (I like to use it to replace some water when making rice). Alternate adding cream and dry ingredients to the wet ingredients until everything is well incorporated. Stir in chocolate chips. 4. Trace an 8 inch circle onto a sheet of parchment paper. For each of the 5 layers, drop 1 cup of batter onto the center of a baking sheet lined with the parchment (keep unbaked dough refrigerated) and use your spatula to spread the batter into an 8-inch circle. Bake until edges are pale golden brown, about 18-22 minutes. Remove from oven. Cool each giant cookie on a wire rack. 5. For frosting: Mix Tofutti cream cheese, powdered sugar, and vanilla sugar in a medium bowl on medium-high speed until pale and fluffy, adding soymilk as necessary to achieve desired consistency. Spread onto 4 cookies. 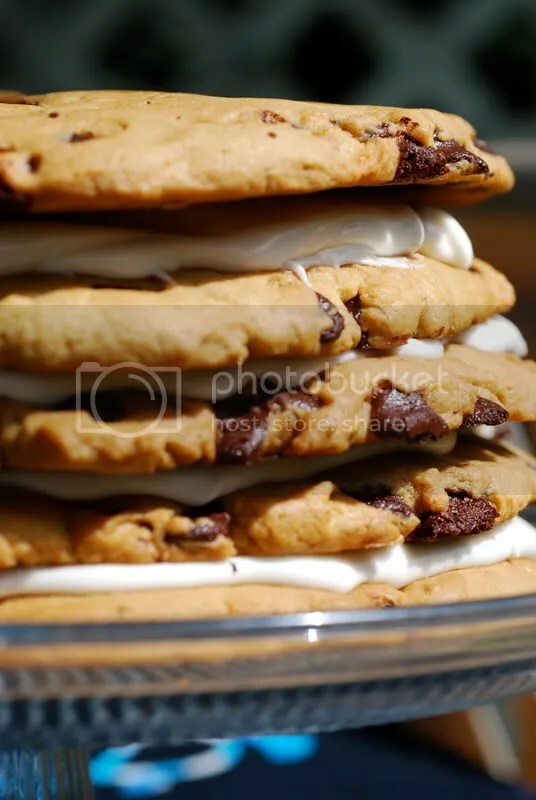 Stack cookies, placing unfrosted cookie on top. Enjoy! Oh my goodness. I don’t want to know how many calories are in that cake! It looks heavenly. =) Who says vegans can’t enjoy the best cakes?! Hehe. OMG. That is the most inspiring food item I’ve seen in a looong time . . . . I CAN’T BELIEVE I MISSED THIS! i’m coming back RIGHT NOW. cookie cakes are my favorite thing ever. i used to get one every year on my bday. maybe, just maybe, i’ll get my own weaver original one of these years. i can’t wait. xo. I remember seeing this on Culinary in the Desert too! It looks awesome! Wow! That “cake” is very impressive–no wonder people were lining up for a slice! If anyone thinks that vegans are starving and sickly from deprivation – show ’em this CAKE! Wow, I am so impressed. You rock! Cookie cake was always my favorite as an un-vegan child, but this tops them all. Romina – I always take the “stick my head in the sand” approach when it comes to dessert calories, so let’s not think about it! James – Maybe this is enough motivation to plan another Hawaiian vacation? Sanja – The idea of drool on a keyboard made me giggle. A good reason why not to blog surf at work! Brilynn – And it tasted as good as it looked! 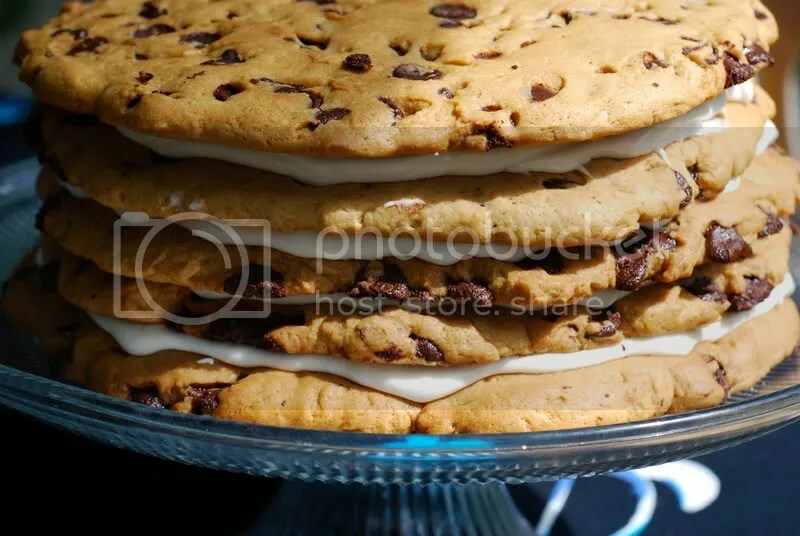 Courtney – It is definitely very appropriate to put cake in quotes – calling it a tower of cookies may have been more appropriate! Ruby Red – Thanks for the comment. That very concept of the deprived vegan is what motivates me to make over the top desserts like this one! What a fantastic job you did on the cookie cake! It is such a fun and impressive treat! Worth every single and delicious calorie. Thanks for checking out my version, Joe! I’m making this for your friend Sharon’s bday this weekend. Is it okay to use vanilla extract in the frosting or do I need powdered vanilla? I’ve never not burned a gaint cookie! Wish me luck! Megan – omygosh, Sharon is going to be so excited! Vanilla extract will be exactly what you need for the frosting. This cookie is pretty low maintenance – just start to keep an eye on the first one after 18 minutes and then you’ll having the timing nailed for the rest of the cookies. Good luck – please let me know how it goes! It worked! Sharon loved it. It was very filling. This was my first venture to vegan baking. I ran out of white flour and had to used whole wheat, so it gave it a bit of a healthy feel! White would have been nicer. I’m thinking of serving this at an Earth Day party for my kids! Thanks for your help. Hello. I am going to be making this cookie cake in two days for a birthday. I was just wondering, if I only have plain soymilk for the icing, and not vanilla, could I just add in extra vanilla extract? How much might be appropriate? Thank you, and might I add that you did a marvelous job with that cake. The pictures are what convinced me to make it in the first place. These were delicious, and pleased non-vegans as well. This is definitely the only chocolate chip cookie recipe I will EVER need. Thank you very much. on September 24, 2008 at 1:45 am | Reply J.W. Thanks! My daughter is newly vegan, but she wanted a chocolate chip cookie cake for her birthday. 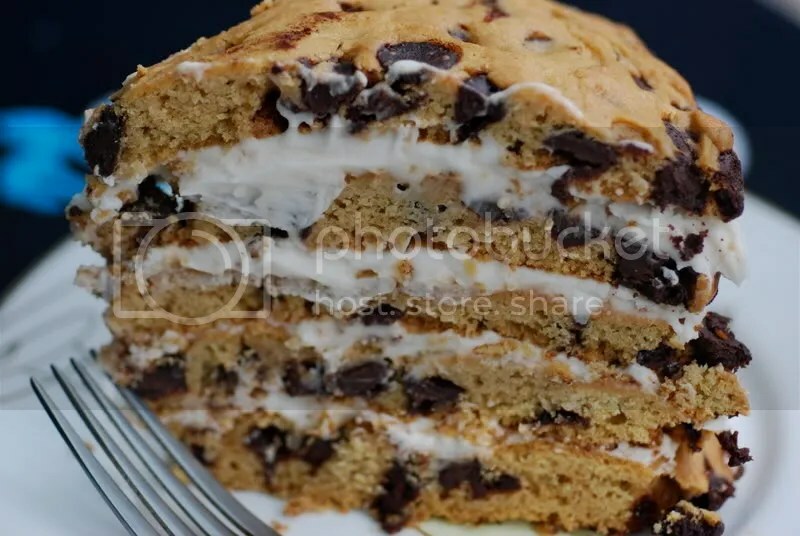 Gritting my teeth and muttering, “how am I going to pull this one off and how will it taste?”, I googled”vegan chocolate chip cookie cake” recipes. Fortunately, your recipe came up. My daughter doesn’t like cream cheese frosting so I made a different vegan white icing, but otherwise I followed your recipe to the letter -even down to the parchment paper. I am grateful for your recipe, because I made the cake yesterday and it was a big hit – even among my non-vegan family members! on November 25, 2009 at 11:12 am | Reply M.
I came upon this, and it looks delicious. I want to make it, but I have a question – for the filling, is a cream-cheese filling necessary? Or can I just go out, buy canned whipped cream, and make it work? [Say if I let it cool for a bit] Also, I am NOT a vegan, nor is this necessarily for vegans [it just looks yummy…] I just want what would taste the best. Thanks!